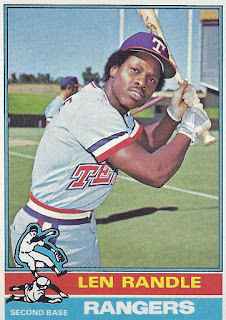 Texas Rangers Cards: 1976 Topps - Len Randle. Kansas City seems to be an odd place for a Topps photographer to set up shop. That's apparently what happened though. Len Randle's picture on card number 31 of the 1976 Topps set isn't the only one taken in KC. Several others clearly show the crown scoreboard in center field. By 1976 Lenny was in his sixth season with the Rangers franchise. That was one more season than the team had been in Texas. He had also gotten married on Christmas day, 1975. He headed into Spring Training with one goal in mind - a starting job. After several years of position changes and practically being used as a utility man, Randle finally seemed to nail down a permanent position in 1976 - second base. He still played some outfield and even a game at third but most of his time in the field was at second. Of course, Randle wasn't the smoothest with a glove at second. He committed 18 errors in 628 chances for a .971 fielding percentage. That was four points below the league average. Some of those errors might have been attributable to Randle having a bit more range than most second sackers but that wasn't the source of all of them. Lenny made 597 trips to the plate in 1976 and posted a .224 batting average. That was over 50 points lower than the previous season. Even with his 46 walks, his on-base percentage tumbled 55 points to .286. There was also a power dip reflected in an 86 point drop in slugging percentage. About the only area offensively Randle saw improvement was speed. He stole 30 bases, an increase of 14, while getting caught 15 times, a drop of four. While the speed was nice, Randle needed to improve both defensively and offensively if he wanted to hold on to second base. There were rumors of a young prospect named Bump Wills coming up through the system. If Lenny didn't get it going soon, the son of Maury Wills might well bump him out of his starting job. "There were rumors of a young prospect named Bump Wills coming up through the system. If Lenny didn't get it going soon, the son of Maury Wills might well bump him out of his starting job. " And when that happens, Lenny gets mad. And when Lenny gets mad, people get decked. etc, etc. Hey! You're moving into 1977 there. Gotta save that for Lenny's next card. BTW, thanks for the welcome back. Still not completely settled so things could be sporadic but I'm hoping I'm back for good.